For review on Drake Sisters Novels: Go here. For review of all books from Sisters of the Heart/Sea Haven series: Go here. Recommendation: Yes, if you want to continue with the Sea Haven novels, believe in siblings made even though not related by blood, believe in second chances and true love. Sisters of the Heart / Sea Haven is the spin-off series from the Drake Sisters Novels written by Christine Feehan. Six women form a family after they meet in a special grief counselling group that deals with victims of violent crimes. Each of them had suffered extreme loss. While working through their grief, they form a unit loving and trusting each other. They combine their resources, buy large portion of the land in Sea Haven and form their own farming community. Each one of them own five acres and have a home of their own, the rest of the farm being shared among them. Though they don’t relate to each other by blood, they have form a bond through heart. Here are the stories of six strong women calling themselves as Sisters of the Heart, dealing with their past, overcoming unbelievable challenges and finding true love. The series also follows the line of Prakenskiis - the seven sons of the seventh son - similar line to the Drakes but all men. They are born in Russia into a family with magic and psychic powers. As children their parents were murdered by corrupt Russian Government officials, separated from each other and placed in facilities that trained them brutally in every way to become enhanced soldiers and killing machines. Now each of the brothers are hunted by their government as their services are no longer required. It is said that where one Prakenskii settles the others get drawn there and settle. Ilya Prakenskii - seventh son and carrier of the family legacy - settles in Sea Haven after resigning from Interpol, marrying the sixth Drake sister, Joley Drake. Now the remaining brothers follow, leaving their past, striving on a second chance at the kind of life they want and falling for each of the six Sisters of the Heart. 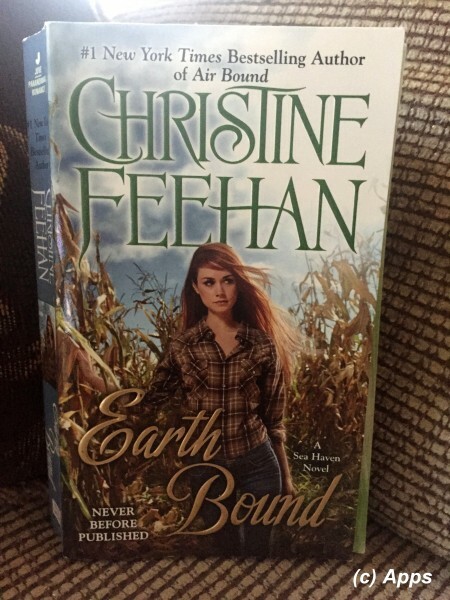 Earth Bound is the fourth installment in the Sisters of the Heart / Sea Haven series published in June of 2015. The story covers Lexi Thompson - the youngest sister of the heart and has ability to control the element of Earth among other - and Gavriil Prakenskii - the second of the Prakenskii brothers, also trained similar to his brothers but now forced to retire due to severe injuries caused while saving the Russian genius Theodotus Solovyov. Lexi Thompson has had a hard life since she was eight years old. Kidnapped in the middle of the night by Duncan Caine - one of the enforcers for one of the branches of the cult Reverend RJ had started - beaten, starved, <insert word>, forced to "marry" Caine and become his "wife" so he could cure her of her sins by doing atrocious things to her. She had worked and lived a life of slave before she could escape the cult at the age of 17. She had met her sisters in the grief counselling group and from then on had lived with them on the farm. Now they were extending their farm by bidding on the land next. Despite the warning from her sisters and their fiancées (Lev Prakenskii, Stefan Prakenskii and Maxim Prakenskii), she goes out to check the land and ends up facing Caine and his henchmen - Peter Rogers and Darrin Jorgenson - again. Gavriil Prakenskii comes to the farm despite the risk that he is being hunted, to warn his youngest brother Ilya Prakenskii - married to Joley Drake - that he is also on the hit put out by Uri Sorbacov and his father Kostya Sorbacov. He comes in time to see Caine and his men hurting Lexi. Between Lexi's ability to control Earth, her defense tactics that she has been learning from Lev, Stefan and Maxim and Gavriil's warrior abilities, Lexi gets saved from these remaining three cult members who had escaped the original ambush when she was 17. Now the puzzling question is how did these people know where Lexi was when was put in witness protection and had solely been concentrating her life in and around the farm? Who else will be coming for her even though these three have been terminated by Gavriil? Gavriil decides to stay on the farm and with Lexi despite his brothers' strong objection. Why is Gavriil using his real name as opposed to an alias? What are his brothers worried about if Gavriil stays there? Is Lexi meant for Gavriil? Is he afraid for Lexi or of her? Will the threat to Lexi be removed permanently? Will Gavriil and his brothers outwit the threat to all their brothers? Who ele is behind them? Chrisitne Feehan as always delves through the dark world of human deprivity. This time the world of cults that are rules by depraved men who think themselves to be god and take the pleasure in teachiing women and girls the right thing and purge their sins with the most unimaginable punishments. The things that Lexi went through gave me shudders, but this is truth that is happening around the world. Another brave topic to broach for and I sincerely wish there are Prakenskiis and Sisters of the Heart along with Drakes who can take these kind of men down permanently. Another intense novel that once you start would not want to keep it down despite the many repeating paragraphs again we see in this book. Go pick it and enjoy it. a) We see that four children - 3 girls (Lucia, Nicia and Siena) and 1 boy (Benito) - who were saved from the human trafficking ring by Maxim and Airiana (covered in the book Air Bound), are in the process of being adopted by them and live on the farm. b) Lissa Piner - the fifth sister of the heart - and her past is exposed and perhaps it gets connected the same goal that Prakenskii brothers have in mind. c) I am still waiting for Elle Drake and Jackson Deveau to come back from their extended honeymoon to see what they will do about Lev Prakenskii settling in Sea Haven - since he was connected with the Stavros Gratsos and although tried to save Elle Drake, Jackson might not see that way. d) I am looking forward to see how will Evan Shackler-Gratsos be eventually brought to justice before the series ends.